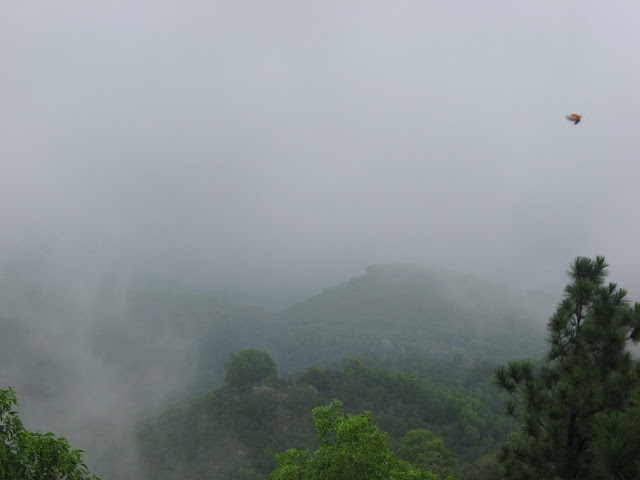 As we drive along the winding roads which lead us to Narayanadri, one of the seven hills which make up Tirupati, the grass becomes greener and the wind becomes cooler, and it is obvious that we are moving away from the crowded temple town. We see a few signs here and there pointing towards some other interesting places to visit, but our jeep driver tells us that it is fitting that we start with the highest point on the hill, where the Lord is believed to have once stood, and taken stock of his domain. “You will like it” he says, and we don’t say a word, wondering what it will really be like! We are heading towards the Srivari Paadam, where the Lord is believed to have left his footprints. This is one of the few places on the hill which I haven’t visited earlier, so I was quite curious about it. According to one legend, the Lord is believed to have first descended to the earth here, and thus left his footprints behind. There is now a small shrine which can be ascended via a few steps, enshrining the Lord’s footprints. While I love listening to the local legends, it seems rather stretching the point to imagine that we can pinpoint the exact location where the Lord descended on earth. Besides, according to the same legends, the Lord is believed to have roamed all over these hills for years, so by the same standards, his footprints should be all over the place. Yes, of course, this is why the whole of the seven hills are considered sacred, but then again, why this particular place? The answer is rather obvious once we reach there. 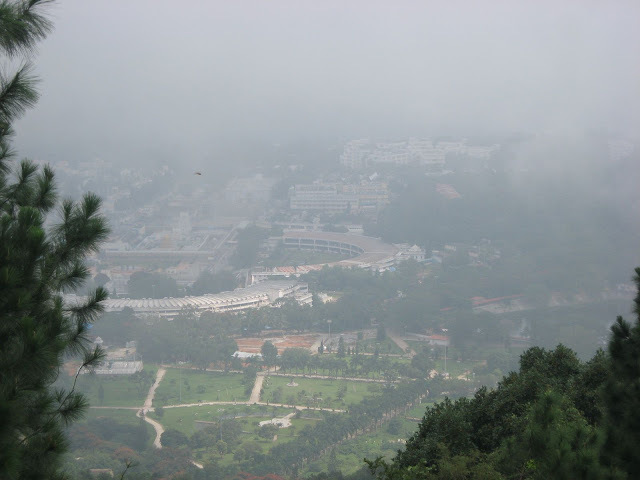 This is one of the few places on the seven hills which command a wonderful view of the valley, and the temple therein. Most of the aerial photos of the temple have apparently been taken from this place. This was mentioned in the museum, which had a collection of photos, all taken from the same place, over years. We could clearly see the small temple town growing in size from year to year! Yes, the USP of this place is the view! My photos aren’t all that clear, because, first and foremost, my camera, which is just a simple DigiCam, but more importantly, the weather, which was overcast all the time. Most of the mountains were covered by the clouds, and we could barely see the valley. Add to this the fog, and you have only patches of white against green blurs appearing here and there! The temple peeped out of the mist now and then, at least allowing me to attempt at photography. Whether they were successful or not, you can judge for yourself! Unfortunately, the footprints bring along not just travelers like me who like to stand and imagine, and feel the presence of the Lord, but also the hordes of pilgrims who have to bring coconuts and flowers and sweets and things, and start dirtying the same place they worship. The whole place is now filled with vendors who sell everything under the sun, who assure you that placing a plastic footprint of the Lord on the stone footprints and taking it (the plastic of course!) home, will assure your prosperity for ages, to photographers who make people stand right in the middle of the steps, take their photos, and then develop it against a garishly coloured backdrop of the temple, and refuse to budge if you want to take your own photographs! However, in spite of the crowd and the distractions, the sight is enough to soothe ones frazzled nerves. I went up irritated, wondering why I had come here, but returned with a smile on my face, a smile which refused to go away, even when I was pursued by a photographer trying to entice Samhith to ask for a photo! 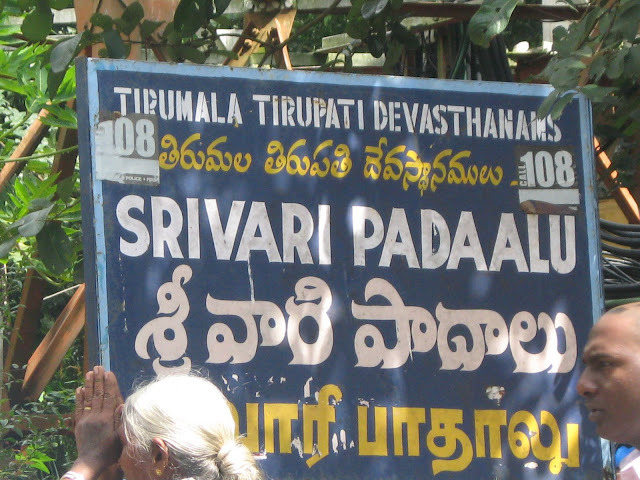 Location: Srivari paadam is about 5 Km from the main temple. 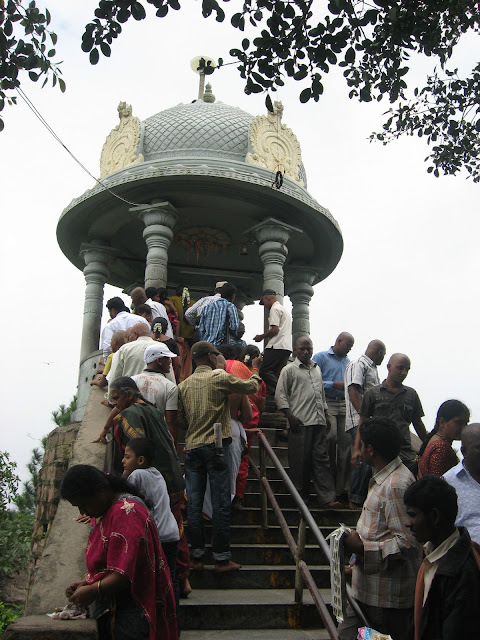 This is one of the few places to which the TTD buses do not ply, so jeeps or private vehicles are the only options. Jeeps usually refuse to make a trip for just one place, so they tend to combine two to three places at least. 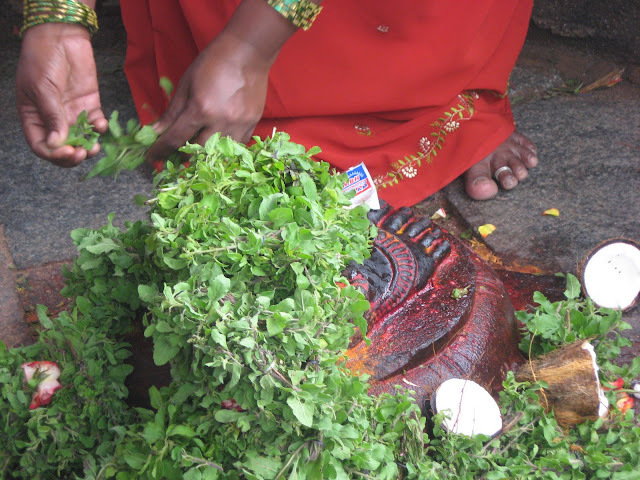 On the same route are the Sila Thoranam and the Chakra Teertham. A visit to all these three places from the TTD bus stand costs about Rs. 300 per jeep, or on a sharing basis, about Rs. 50 per person. Must have been beautiful view from the top. I remember visiting this place long long ago..20 years back... but do not remember any other thing about this place...So thanks for the info.. Must visit this next time. Anu,Inspite of the mist I loved the valley view. 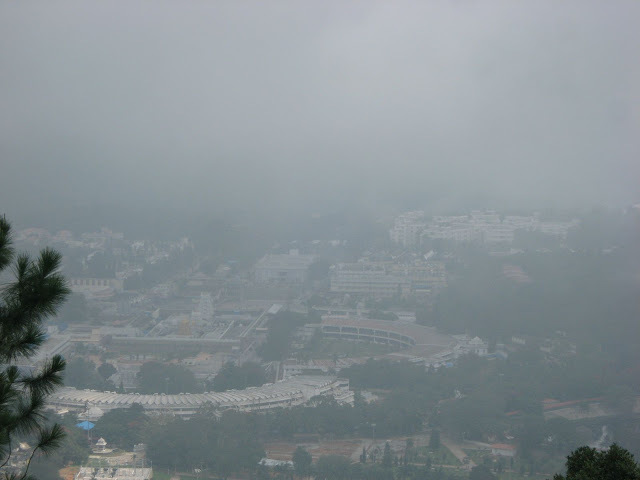 I also came to know about the Lord's feet through my neighbour who visits Tirumala twice a year.